I’ve been around boats and the bluewater for about 33 years and in that time I have owned three glass boats. When I was given the okay by the household accountant, I started looking around boat shows, yards and the internet. I ended up at Blakes Marine in Sydney. Knowing Alan for many years the purchase of the Bar Crusher was a smooth transition from the test run to signing on the dotted line. Some of the features that swayed was the way that the roof and the windscreen folded down to allow it to fit into the normal size garage, also fitting on a single axel trailer which makes it easier to tow. Easter 2006 the Bar Crusher 575C had arrived but the 115 Evinrude E-Tec had not, so Alan knowing how much I love fishing put a 115hp Yamaha so I could use the boat over Easter. Two weeks after Easter we fitted the 115 Evinrude E-Tec. Its handling control in medium to heavy seas was fantastic. At rest it is one of the most stable boats for its size I’ve been on. Fishing the banks which is about 8-9 mile off Crookhaven Heads with a swell of around 1.5m to 2m for most of the day, in the late afternoon a strong southerly started to blow, with only a game boat and the Bar Crusher still there, it was suggested that we pack up and head for shore, by the time we got under way the seas had risen from 2 to 5 metres, we ran into heavy sea and very strong winds, at times I was concerned as we had water up over the top and had the bilge working overtime. 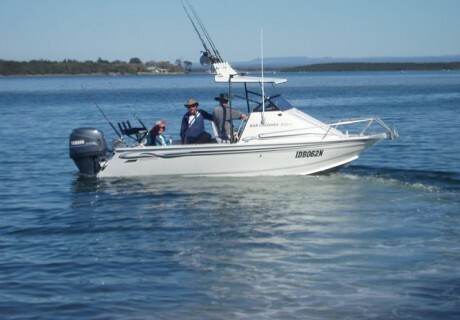 We finally made it to the entrance of the Shoalhaven River only to find the game boat was about two mile behind us. I was very impressed and they were extremely surprised. We have made two rescues in the 575C resulting in everyone coming back to shore, safe and sound. We also use the Bar Crusher for skiing and wakeboarding. After fitting a full-size wake pole we’ve turned many heads on the Nepean River at Penrith in amongst all the ski boats. To sum this up – it’s one hell of a boat! Many thanks to everyone at Bar Crusher and Blakes Marine.